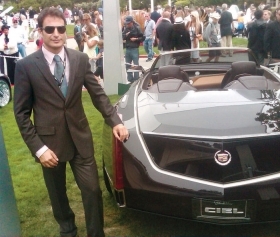 Gael Buzyn designed the interior of Cadillac's Ciel concept. PEBBLE BEACH, Calif. -- When General Motors Co.'s design bosses decided to celebrate a golden era of American autos by creating a brash Cadillac convertible concept, they turned to two young Frenchmen. The result is the Ciel, French for "sky," which glamorizes American styling as only someone with an outsider's perspective might. "This, to me, is the true American dream," says Gael Buzyn, 38, the Ciel's French interior designer. "To get the chance to work in America is a great privilege. But to get the chance to help re-establish the grandeur of this brand is an unbelievable opportunity." The Ciel, unveiled at this year's Concours d'Elegance here, features an almost exaggerated full-sized interior that evokes an image of the late 1950s and early 1960s. That was an era when the world seemed full of Cadillac convertibles rolling up with Hollywood starlets in sunglasses behind the wheel. The cockpit features long, flowing armrests, a space-age instrument panel, a rear-seat cigar humidor, wine-colored leather seats and light wood finishes. Buzyn and his partner on the project, Senior Creative Designer Charles LeFranc, 29, ply their design trade at GM's studio in Burbank, Calif. Buzyn says he has admired Cadillac since his childhood in France. He marveled at the styling of the big cars he saw in films and occasionally in the south of France as wealthy Europeans headed for the beach. The chances of the Ciel (pronounced see-EL) going into production are slim, but not nil. GM's Chinese operations have expressed an interest in the concept car for the local market -- an expression that carries considerable weight these days. Otherwise, the Ciel could simply serve as a design direction for the brand. The Burbank studio has become GM's advanced design center, and what LeFranc and Buzyn have created could inspire the interiors of upcoming GM large cars. "We wanted to be able to influence the mother ship," says Buzyn, who previously worked in design at Volkswagen AG. LeFranc came to Burbank from GM's Opel subsidiary in Germany. Earlier, the duo created GM's 2010 Cadillac Urban Luxury Concept. That car was at the other end of the spectrum -- a compact vehicle that demonstrated how Cadillac could offer luxury for congested urban settings. The Ciel is a design exercise in old-fashioned Cadillac grandeur. Its body is a foot longer than Cadillac's CTS sedan. "Our management said to us, "Create a car for two couples on a weekend trip through California wine country,'" Buzyn says. "We thought that it should reflect California in its materials and its openness. "It should be a car in which you enjoy le voyage," he says, rolling the French words into his walkaround of the vehicle on display at the concours. "I think the English words convey the same meaning as the French. I mean, it is about the journey. Traveling in this style is about enjoying the travel itself." Buzyn and LeFranc used wood from a 350-year-old Italian olive tree to trim the interior. They also elicited the help of cabinetmakers to get the most out of the material. The team scanned each piece of wood with a camera, and then used a computer to analyze its grain. The computer matched the grain with a schematic of the car to determine where each piece of solid wood -- not veneer -- could be most effectively placed. Buzyn also minimized the presence of vehicle controls in the car. To avoid the visual clutter and distraction of modern cockpits, the instrument controls, such as navigation, air conditioning and turn signals, are not visible until they are summoned by a wave of the hand. The controls are confined to the driver's line of sight, rather than running down the car's center stack. Navigation maps and vehicle information are displayed only directly behind the steering wheel. Air vents are concealed under the dash panel. The front passenger has access to an information panel, but not vehicle operating functions. The narrow passenger side display only provides information about local points of interest during the trip -- data are delivered to the passenger via OnStar. Even the car's gear shifter is concealed until the car starts, when it automatically slides out of the driver's armrest. A retractable cashmere blanket can be pulled out of the rear seat to warm a chilly open-air ride. The annual Pebble Beach event is renowned for lavishly expensive restored antique cars -- Bugattis, Jaguars, Packards and Pierce-Arrows from distant eras. While the new Cadillac concept evokes memories of the American big-car era of Marilyn Monroe and the Rat Pack, it is no antique, Buzyn says. The concept includes a twin-turbo 3.6-liter V-6 hybrid powertrain. The gasoline engine-lithium ion battery configuration promises 425 hp and the ability to run solely on electric power at low speeds. "For this project, we looked back into those years at what Cadillac was doing," he says. "Not to just re-create the look, like some kind of restored antique, but to understand what made it so iconic in the first place. Those attributes remain modern today."